This morning I came across Dennis LoRusso’s interesting post on how the language and logic of appropriation ought itself to be our object of study. Have you read it? No? Well, you should. For it nicely represents the sort of shift we’re trying to make here at Culture on the Edge. 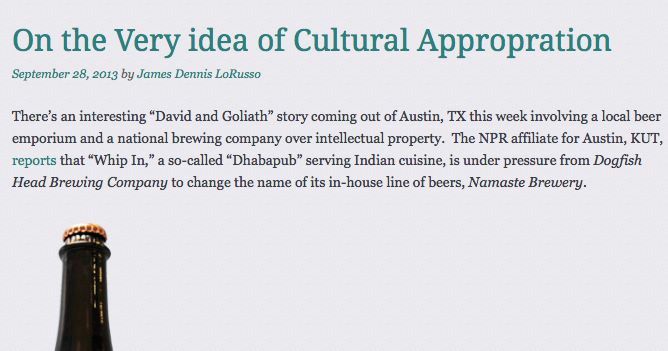 Perhaps what is most interesting about this dispute therefore is not how contemporary business appropriates religious beliefs and practices in the pursuit of profit and brand identity, but rather how the very idea of “appropriation” is premised on a notion of ownership grounded in the logic of capitalist markets. As I then commented on Facebook, when reposting it, it seems to me that, too often, scholars get sucked into taking sides in debates over appropriation (e.g., who owns yoga and is it really religious?) instead of examining the very presumption, implications, and conditions (in a word, the logic) of identity and ownership. And this is how, despite our claims to have left these old ways in the past, the discourse on sui generis religion, or identity, or culture, etc., yet remains an unproblematized building block of much of our work, since many of us still presume some sort of pristine and thus originary point that needs protection, instead of seeing it all as a large circulating system of negotiation and contest and borrowing and taking and taking back and taking again — and thus seeing the discourse on appropriation itself as our data, as but one more strategy actors adopt to create the impression of singularity and possession and cohesion and rank, so as to assert some sort of governance over that seemingly out-of-control circulating system we call social life.